The unlikely but real-life tale of shanty-singing seafarers whose novelty debut album triumphantly sailed into the UK top ten. British cinema is as well known for its charming tales of triumph over adversity as it is for the darkness of its kitchen sink grit. Just look at 2014’s Pride or last summer’s Swimming with Men and you get the picture. The latest entry to that underdog canon is Fisherman’s Friends. 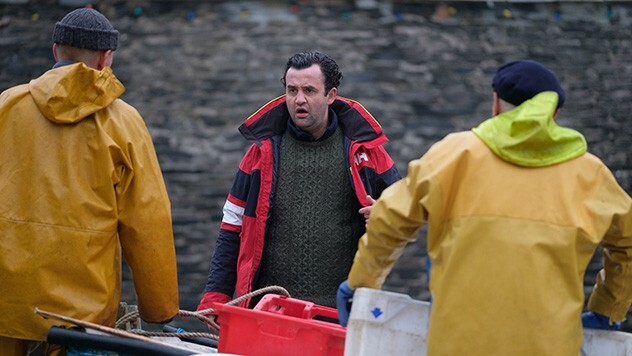 When hotshot music producer and city boy Danny (Daniel Mays) arrives in the Cornish fishing Port Isaac on a stag do, a prank gone awry leaves him stranded alone in the village. Urged by his boss to try to sign the local sailors, who regularly perform in the harbour, a bewildered Danny tries to make the deal a reality. He’s unaware that this is yet another wind-up but when something in the music speaks to his romantic soul, Danny makes it his mission to bring the fishermen and their music to the world. Director Chris Foggin’s lovely little film, while gleefully wallowing in its weirdness, smartly knows when to get serious and land some truly emotional blows. (Research Chris Coetsee) Come and see a bunch of old jumpers truly singing their hearts out.